I bought this bike second hand in the late 1960s. 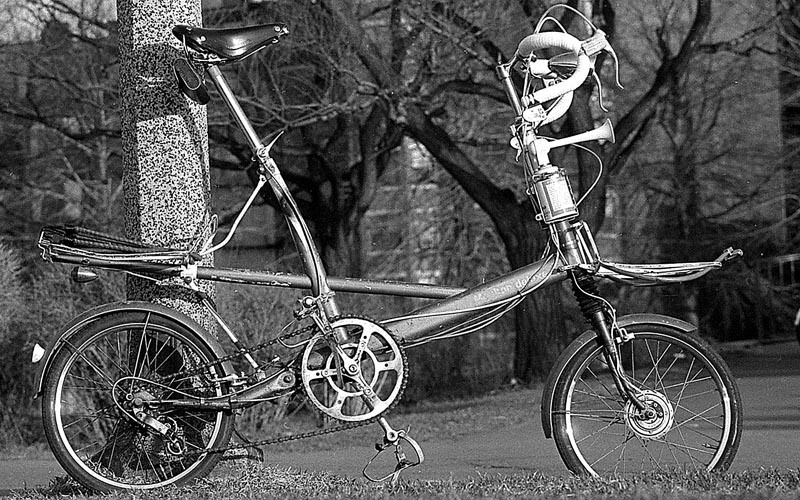 The "Deluxe" came with a DynoHub lighting system and a 4-speed Sturmey-Archer FW hub, as opposed to the AW 3-speed on the Moulton Standard. The DynoHub was really not designed for the 349 mm (16 inch) wheels, and I was never able to find a bulb combination that would give good light at reasonable speeds without burning out at higher speeds. I customized this bike considerably, adding a 4-speed derailer system, and converting the hub into an S-5 5-speed. I also replaced the original 52 tooth chainwheel with a 58 tooth TA unit. I mounted a pair of water bottle cages on either side of the head tube. In the photo above, one of these is occupied by a Freon "air" horn, which I used for a while. I also replaced the original all-rounder handlebars with drop bars, original mattress saddle with a Brooks Professional, among other upgrades. Having a bike with full suspension in the late 1960s was quite a kick, and I am afraid I rather abused it. On on occasion I "lead assed" it while riding off a curb near Boston Common, and managed to bend the seat tube pretty badly. I "straightened" it out by bending it back, using a handy parking meter as a fulcrum. In 1969 or so I rode this bike to Montréal. I had a $15 canvas pup tent and a $15 kapok sleeping bag, had the bike very heavily loaded with other stuff and off I went. I chose a route that mostly followed rivers, to minimize climbiing. I went up along the Connecticut River to White River Junction, then along the White River to the Winooski River. From Burlington Vermont, I took the causeway out to the Hero Islands in Lake Champlain and up straight north to Montréal. I actually rode across the forbidden "Pont Champlain Bridge" but didn't get caught. Just outside of St. Johnsbury, Vermont, my damaged seat tube let go and folded up. Bummed, I stopped and stuck out my thumb. Almost immediately a pickup truck stopped and picked me an my wounded bike up. It was late afternoon, a Sunday, I believe. The kind soul in the pickup took me to his family's farm, fed me fresh sweet corn and let me camp overnight on their property. In the morning he drove me in to a local welding shop where I got the seat tube repaired after a fashion, as you can see in the photo above. The seatpost was permanently stuck by the welding job, that's why the saddle clamp is upside down. Another memorable part of this trip occurred on the causeway between Burlington and the Hero Islands. It was a hot August day, and I had about 30 heavily loaded miles behind me when I hit the causeway. The causeway is basically just a long sandbar with a road on it, but halfway along there's a small island, about the size of a small city block. There are no buildings here, just parkland and a couple of picnic tables. There was a beautiful looking white sand beach, and I decided to go for a swim. I changed into my bathing suit behind a convenient tree, and ran out into the waters of Lake Champlain. The water looked crystal clear, delightfully cool on this hot day, with fine soft sand beneath it as I ran out into the lake. And ran. And ran. And ran...by the time I got half a mile from shore and it was still not much deeper than my ankles I realized that I was not going to get in a swim after all! The Moulton was quite a sight with the front and rear racks piled high with cheap camping gear, and when I got to the border entry point I had a bit of difficult with the Canadian customs agent, who was suspicious that I didn't have a license plate on what he assumed was a motorcycle of some sort. I explained as well as I could that it was a bicycle (his English wasn't much good, and I didn't speak French at that time.) He thought the water bottles were the gas tank, and was reluctant to believe that I had pedaled all the way from Boston...but I managed to convince him in the end.